Making it through the first year of parenthood is a huge achievement, so when my daughter turned one this month we knew we deserved a celebration. What better way to celebrate than to share a lovely spring day with friends and family, good food and champagne, and these fresh creamy tarts — perfect for the high-tea themed party and featuring her favourite food! When food is this simple, the ingredients should be perfect. When designing the filling for these, I called on a few of my favourite providores for their fresh produce; a beautifully creamy ricotta from Paesanella, some home-smoked trout and fresh peas from Marrickville markets. The tart shells can be homemade if time permits, or otherwise bought as the perfect shortcut – I absolutely love these thin shortcrust cases from Pasteles Bakehouse. 1. Place ricotta, 1.5 cups of peas, lemon zest, salt and pepper in a food processor and blitz lightly until you have a smashed consistency. Be careful not to overwhip, or you will lose all the lovely texture from the peas. Alternatively, mash these together by hand. Flake the smoked trout into large pieces ensuring you remove all fine bones. 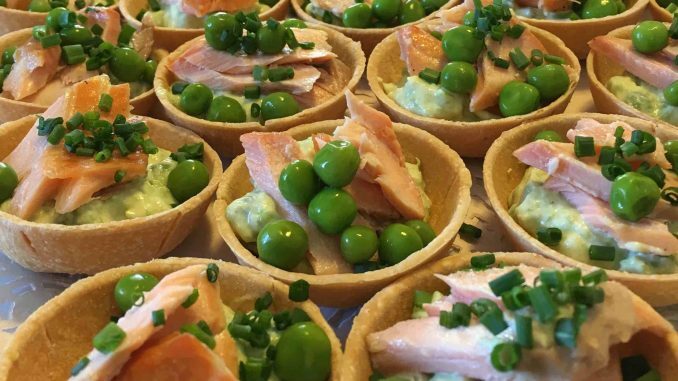 Place a dollop of the smashed pea mix into readymade tart shells, top with flaked trout, chives and a few peas. Serve immediately. Note: This filling would also be perfect as the topping to a large puff pastry or filo tart.